Finding the most appropriate materials or books for a particular lesson is such a joy for independent homeschoolers like us. That's why we were so happy to have bought Tahanan Books' new board books designed for children who are 0-4 years old. Kumilos Tayo, Ate! 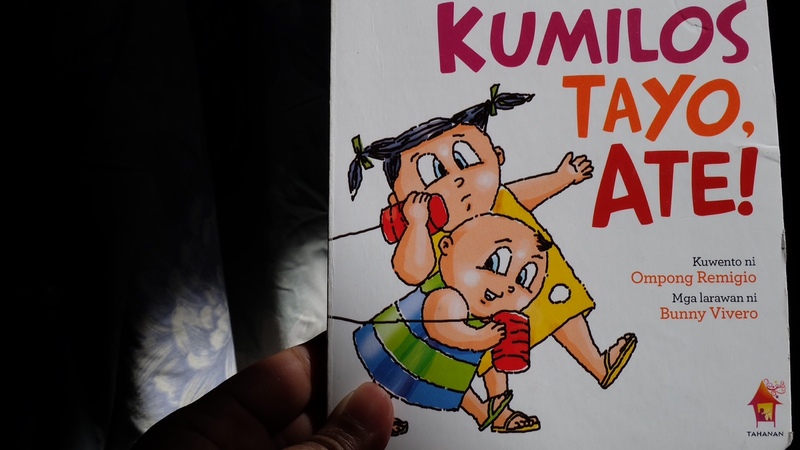 and Kumilos Tayo, Kuya!, written by Ompong Remigio and illustrated by Bunny Vivero are perfect for our preschool homeschool lessons this June. We are starting to teach our little boy how to read simple Filipino words. This month, we have lined up seven letter sounds for Rio's reading lessons. We also decided to teach him the different parts of the body in Filipino. The two "Kumilos Tayo!" board books made teaching these topics fun, easier and more relaxed for us. Teaching the different parts of the body and the corresponding actions they make became easier when we used these board books. Paa for tumakbo and lumukso. 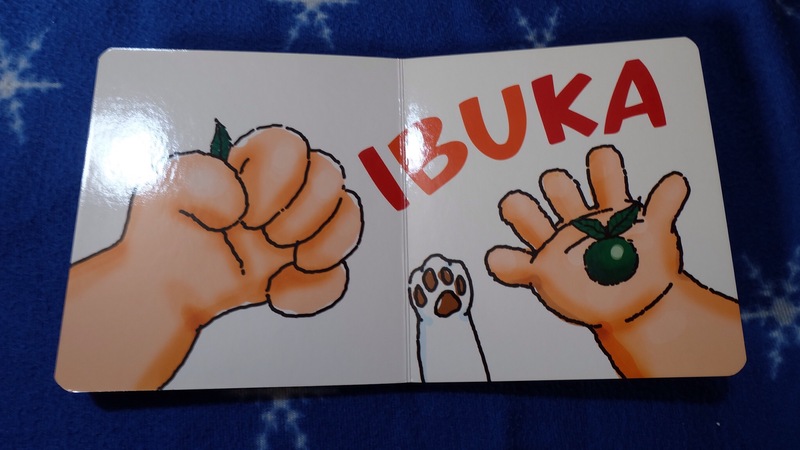 Kamay for ibuka and itulak. 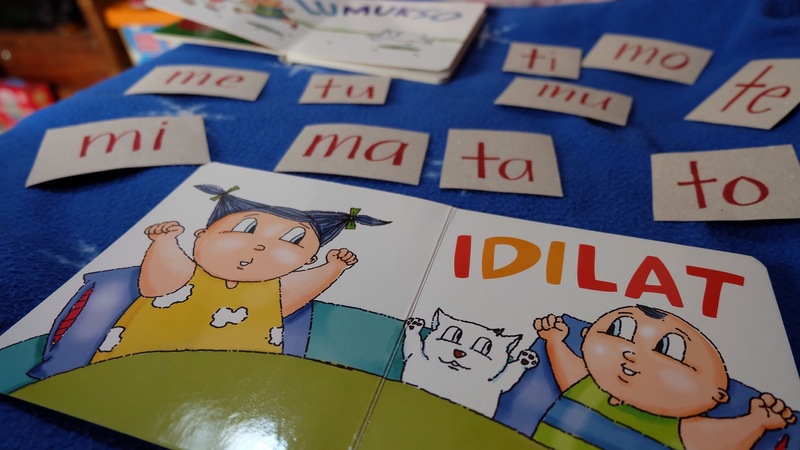 The action words included in the books are familiar activities that children do. Using these words worked well in getting my son's interest which also made it easier for him to focus on learning how to read. Nagmano : Laging nagmamano si Rio kay Lolo Diko. Tumakbo : Mabilis tumakbo si Rio sa park. Syllables are also written in different colors. 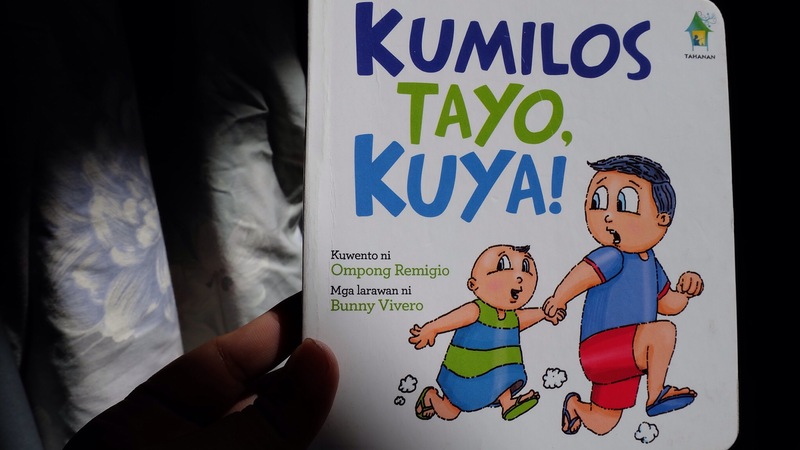 In the other Filipino book we are using, syllables are separated by hyphens (ma-ta-ba), making it harder for my little boy to blend the words when these are removed. The one word per spread also encourages children and even parents to create stories. In "Kumilos Tayo, Ate! ", the book starts with the word idilat and ends with ipikit. At bedtime, I use this book to engage my son in a conversation about the activities he did the entire day. He will tell me these words : laro, ligo, kain. When we reach the last page and word, it means it's time to close his eyes and sleep. I can't wait to let Rio experience the word "sumipsip"as shown in the book. It reminds me of my favorite summer activity with my kababatas (childhood friends) - sipping something out from those santan flowers. We will definitely bring along these board books when we hit the beach, magbabasa kami habang nagduduyan! 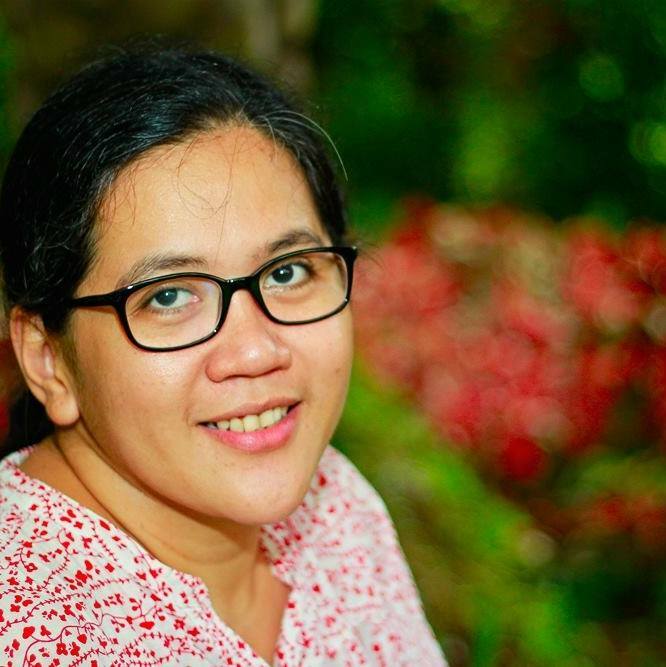 Nanays, what are your favorite Filipino storybooks? Name some of your children's favorite Filipino action words. Let's share our favorite picks and stories. Hi May! I got these books from Tahanan Books' warehouse sale last month in Makati. You can try to look for these books at The Learning Basket's shop. Baka may stocks sila. Miss you, sis! Miss you too, sis! Dami ko kwento! Lol I think even my teenager can benefit from these books! I recently brought Filipino books from Adarna and I think they're great for learning at home, especially since we do not speak Tagalog. Most of our children's books here are US based so it would nice to add more books based here in the country. Thank you for these recommendations, Nanay! I can't remember buying any Filipino storybooks for my kids, since I don't think I had one when I was younger. We have Filipino textbooks though from the school but I admit, we only use it to study if merong homework. Hehe So far, I haven't really taught my kids Filipino since we basically speak Bisaya. But good thing, we watch local TV programs naman everyday, so expose sila sa language. Teaching my youngest to read too. This is a very helpful read. Ang cute naman ng books! I will check these when I visit a bookstore. it was rather tricky to teach the little ones Filipino, i wish i discovered this when my little man was just learning to speak tagalog! it is good that mums + children have more options these days. my favorite Filipino books are those adarna books they sell in schools, i have one called "ang prinsipeng ayaw magsalita"
Good day Mommies! Our Kumilos Tayo board books (Php 150.00 each) are available in all branches of National Bookstore, Powerbooks, and Fully Booked-The Fort branch. Thank you. My son is still young, 19 months old only. But I guess, I will need these books in the future. The price of Php 150.00 is good enough already considering that it is a "board" type of book. Thanks for sharing! This is very helpful for WAHMs in teaching their kids at home. My kids were raised speaking in English. But my eldest, who's now in Grade 6, can speak Filipino fluently. My second child, who's 3 y/o, still has a lot of Filipino words to learn. Good thing her schoolmates mostly speak in Filipino so she can learn among her peers, just like my eldest. Why not? We can start with these simple and basic Filipino action words. I know there are comics written in Filipino. You can search for Manix Abrera's works. Your teenager will love his works! You're welcome, Pam. 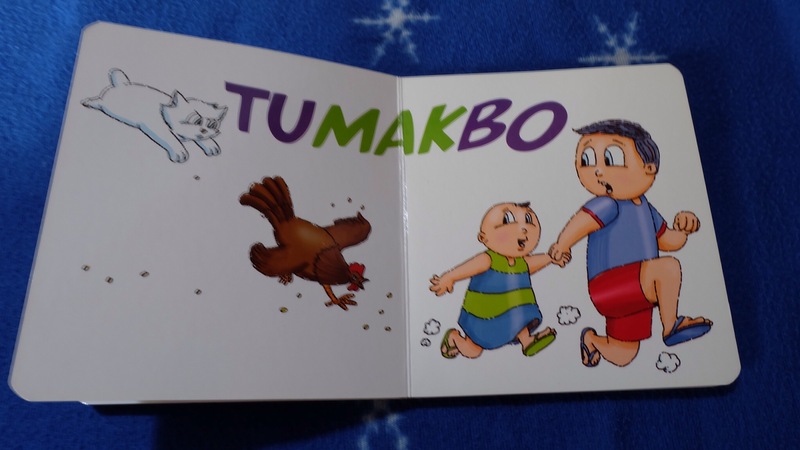 Filipino storybooks can be very helpful in teaching the richness of our culture to our children. We're also working on our Filipino book collection. Thanks for reading! Thanks! Challenging magturo magbasa, no? But listening to our children as they independently read the words can be very touching and fulfilling. Iba ang feeling! Yes, do check them out. Fun and very helpful books! My son invents Taglish words like ligo-ing, walis-ing! Kaloka, di ba? It's best to start with familiar action words in Filipino to make it easier for them to recall and say. Yes, these books are very helpful. My son can easily identify the words with common situations and daily activities. Kanino ka nagmamano? He will enumerate the names of his Lolos! Thanks for reading! Wow! You have Pepe and Pilar books. :-) I used to read Filipino comics when I was young. It helped me to learn the language in the easiest, most simple and fun way. 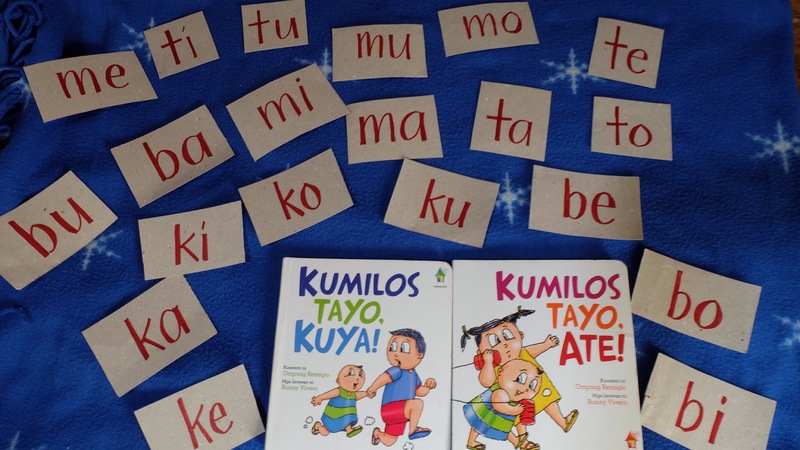 These Kumilos Tayo series are gems, very useful for beginners! These are available at NBS branches. :-) Buy na! Your daughter will love the books. You can do a lot of creative activities out of the action words included in the books. Enjoy! Yes, you can start reading aloud the action words to your son. He will love the illustrations in the books. Besides the action words, you can also teach him Filipino words through the drawings -- bulaklak, aso, puno, aklat, etc. I think conversations with other children in Filipino is one of the best, if not the most effective, way to make our children learn the language. This is great material for homeschoolers! Thanks for sharing! I need these books! My eldest is having a hard time reading in Filipino. Hi Mommy Lani! Naku, super kulit ng anakis ko. Hehe. Thanks for dropping by.